Thomson Reuters Foundation – As Baltimore was convulsed by protests in 2015 over the death of a young black man in police custody, a handful of people in the eastern U.S. city started worrying about a related issue: food. Thousands of demonstrators thronged the coastal city’s streets to protest the death of Freddie Gray, 25, forcing shops and schools in some neighbourhoods to close — creating sudden food deserts, particularly for many people without a vehicle. “People didn’t have access to food,” said Darriel Harris, a Baptist preacher, noting that many in the impoverished community where the protests hit hardest ate hand to mouth, relying on convenience stores or school lunches. “If you’re getting your food from school or if you’re getting your food from the corner stores, and then the schools and the corner stores close — then how can you eat? It became a huge issue,” he told the Thomson Reuters Foundation. In response, Harris and two others quickly began to organize, drawing on contacts who had access to farms in nearby states and bringing supplies into affected neighbourhoods to distribute via a local church, one of several groups doing so. Their Black Church Food Security Network now plans to expand across the Mid-Atlantic states — with 20 churches in Baltimore alone already on board — as part of a burgeoning movement that brings together religious communities and agriculture. 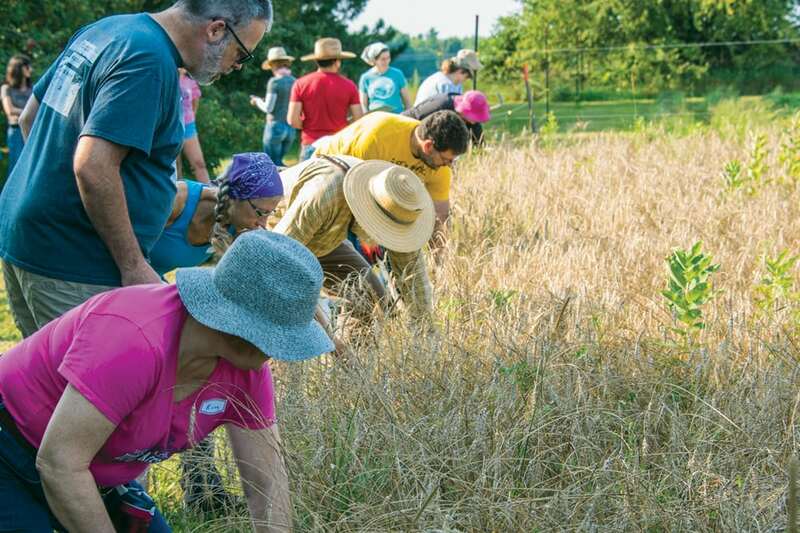 Across the United States, more than 200 faith groups are members of an emerging Christian Food Movement, which promotes more sustainable food systems by growing their own crops, bringing idle land into use, and feeding the poor and hungry. Harris says about nine churches in Baltimore are growing their own food — some selling it at reduced rates, and others giving it away to their congregations. “Within the black community, the staple organization is the black church, and the black church is the largest landowner in black communities,” he said, sitting in the small, urban garden that he oversees, staffed in part by ex-prisoners. The Episcopal Church — headed by Bishop Michael Curry who delivered Prince Harry and Meghan Markle’s wedding sermon — passed a resolution in July to use more church-owned land for regenerative agriculture and biodiversity conservation projects. The Episcopal Church — the U.S. arm of the Anglican Communion — has about 6,500 parishes and missions and 1.8 million members in the United States, according to church data. “We are coming to the painful recognition that we may not have local congregations everywhere that they currently are to steward these properties,” said the Nurya Love Parish, an Episcopal priest, who spearheaded the initiative. Parish practises what she preaches. She started Plainsong Farm & Ministry in the midwestern state of Michigan in 2015, which brings people together to farm organically, learn about the environment and pray. Moses Kashem, 28, is also keeping a close eye on idle church land in Miami, where he lives and, for the past year, farms. After dropping out of medical school to farm in 2013, Kashem looked for property to cultivate — but quickly hit an obstacle. “Land in Miami is very price prohibitive,” he said. While worshipping in Saint Simon’s Episcopal Church one day, he noticed that it sat on four acres of unused land. “It was just a barren field,” said Kashem, who persuaded the church leadership to grant him a three-year, renewable lease to farm a portion of the land. Kashem now has the only certified organic farm in Miami, selling vegetables to clients — including Whole Foods, the high-end grocery chain — and giving the church a cut of the proceeds. He has also started getting inquiries from other churches with land to spare, including the local Catholic diocese, which owns 50 acres used by the Marian Center, a school for people with special needs. The centre is in discussions with Kashem about teaching its graduates to farm on the site, said board member Maria Fogarty. Kashem wants to expand his operation to start cornering the region’s market for locally produced organic vegetables.